Industry Veterans Partner with Industry Leaders Microgaming and GiG to Launch the Next Great Online Poker Room. 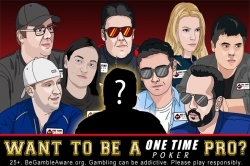 Isle of Man, Man, Isle of, March 01, 2019 --(PR.com)-- OneTimePoker (OTP) has officially launched on the Microgaming Poker Network (MPN) and right out of the starting gate has launched a novel campaign which shows the prowess of its experienced management team. You will have a chance to become a Pro Ambassador in their “Become A Pro” promotion. Become A Pro is a promotion where OTP customers are evaluated by an independent panel who will award 3 players a pro ambassador contract – the very same one the current OTP pro team has in place. The promotion kicks off March 7th, running through the end of April. Players can sign up here now and register to be a part of the most exciting poker competition in years. OTP was founded by Randall Kasper, Casey Jarzabek, and Jeff Maxon and management also includes Anthony Taylor, the former CEO of the Merge Gaming Network. Combine that with a highly accomplished and well-respected Pro Ambassador team led by Canadian pro Danny Noseworthy, and all the ingredients for success seem to be present. The OTP group has a long history of accomplishments on the business side of the poker and gaming industry. OTP also has two casinos, one built right into the client and one external which includes a full array of slots and table games, including a number of live-dealer tables. Kasper was the founder of Poker Players International and has represented hundreds of professional live and online poker pros from around the world. He has also represented corporate clients seeking to attract liquidity from the poker community, Bestbet, and DraftKings, being two examples of tremendous success. “We have seen firsthand, what has and what hasn’t worked for poker sites for more than ten years now. We are always going to do right by the player and everything good for us will flow from that,” commented Kasper. Jarzabek is not only an accomplished online poker player, with over $5 Million in earnings, but is also the founder of Tournament Poker Edge, the world’s leading online poker tournament instructional site. He’s also been the pro team manager for several sites, with tremendous success in customer acquisition and satisfaction. “We want our players to succeed, and to experience a sense of community while they enjoy and learn the game they love. That’s one reason we decided to make our first promotion Become A Pro, because it recognizes the players. Our Pro Ambassadors are our link to the community, great examples of professionalism and we want to highlight and expand our team and reward players who stand out amongst the competition along the way,” added Jarzabek. Maxon is a tried and true veteran businessman, with two decades of Wall Street experience in global business within and outside the gaming space. “We are grateful for our opportunity to show players we care. This initial promotion is just one of many to come where we will do just that. We will not make them jump through hoops or spend a ton of money to be treated well, hence our decision to award automatic maximum rakeback and top tier deposit bonuses. We’re looking forward to growing our community and our brand to become a major force in the industry, and it all starts with how we treat our customers. With partners like MPN and GiG, and our experienced management and ambassadors, the sky is truly the limit,” concluded Maxon. Taylor, as mentioned, was CEO of Merge Network which experienced explosive growth under his supervision. Sign up here to play on OTP and receive 30% rakeback and your ﻿welcome bonus.